Turning out an anthology of work by nine different authors in ten weeks is no mean feat but yet again it has been achieved by the students of the creative writing class at Central College, Nottingham. 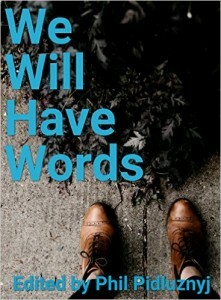 We Will Have Words has been edited and produced by Phil Pidluznyj and Mark Barry. I always enjoy reading the work of fresh new voices and here is my review. Becoming Jessica by Carla Eatherington is a great start and is the psychologically creepy tale of a young homeless girl who is given a glimpse of what a comfortable life could have been before the chilling truth is revealed. I enjoyed this story very much and in fact was unable to put it down until I reached the end. There are a few bits in it that were a little rushed as is necessary with short stories but the author did a good job of painting the picture, I was fully engaged, and there is no much potential in the story it could be developed into a much longer read. Nero by Nick Mann is a story based on military history. Now my historical knowledge is poor but is not as bad as my knowledge of military history which is shockingly poor so I had no idea whether this story was true or not. However, a rudimentary googling tells me that there was indeed a Battle of Dettingen in May 1743 and King George led his troops into battle, the last king to have done so apparently. So I’m guessing this is faction i.e. fiction based on fact. I enjoyed this story. It was different from anything I usually read, tightly written and with good description. Deborah by Gwilym Moore is the well told tale of Oliver Harding, manager of a retirement housing, who has to deal with the untimely demised of one of the residents. The description and attention to detail in this story is very good and I could picture the setting and characters clearly, and sometimes…ahem…only too vividly and I’m very glad Deborah had someone as thorough and caring as Oliver with her at the end. Tribute by Kit Bachmann is a fantasy tale of Hunters, false identities and I guess sacrifices. I felt as though this was part of a longer story or perhaps only part of what the author has planned in their head as there were mentions of different clans that had no relevance here but I can see would have as part of something bigger. I don’t generally read fantasy so this was interesting for me and the ending is creepy but I’ll not say any more as I wouldn’t want to spoil it for anyone. These Streets Don’t Love You by Liam Foster is a tough read about Peter and his half-brother Dwayne. They drink, take drugs and things get out of hand when they go out one night however the story ends on a sense of redemption to come which lifts the spirits. The Turtles Path by Don Scott I found fascinating. This author has brought his knowledge of ecology and human migration across the world and blended it with fiction. I loved the descriptive build-up of the families lives in the village and what happens when trouble comes. The preface and epilogue added useful explanatory information to back up the story. The Pilgrimage by Sam Gill is the story of a family travelling back to India to take part in the Baba Balak Nath Ji’s pilgrimage as seen from the eyes of a fifteen-year-old boy. Wonderfully descriptive of the things he saw and experienced as well as the life he missed from home I thought this was a memoir and ‘…we were foreigners in India and we were foreigners in Britain; it left me with a sense of not belonging anywhere’ was very telling. 10,000 Miles from Oxford by Alfonso Lygo tells the story of Hilary who is not about to bow out of the ‘political football’ (loved that!) that is the NHS to take up a bit of light gardening on her retirement but rather takes on the challenge of a contraception project in Kenya for three years. Married to the wandering and useless Bryn I cheered when she met Mac but I won’t give any spoilers about the ending. So onto the Poetry and as I cannot write this at all I’m always in awe by those that can and in this book there is a delightful collection of some excellent examples. Atit Rai wrote Since I’ve Lost You which is a heart breaking account of lost love. The Bridge of a Thousand Snakes by Alfonso Lygo is the worrying tale of a traveller abroad and going where he shouldn’t. Let you go by Lisa Bird is a lovely, if terribly sad, piece with so many beautiful lines in it and the dedication at the end tells its own story, and shows how this was written from the heart. The Burning Man by Kit Bachmann is filled with energy and anger – good stuff. Memory’s Wings by C.D. Elmore is exactly as it says at the beginning, a journey back in time and reminiscences of a childhood life. This was so delightfully familiar in many ways it made me smile time and again. Poor Snowy! A most excellent haiku comes next from Alfonso Lygo, A Capital Haiku. This is then followed by many wonderful haikus on a range of subjects from C.D. Elmore and Gwilym Moore.